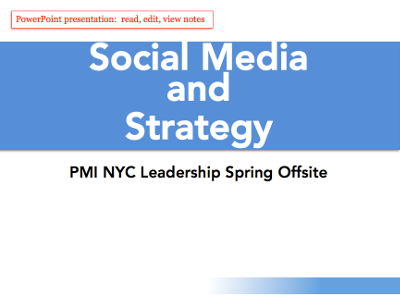 Yesterday at Project Management Institute New York City chapter all-day retreat to focus on communication and collaboration. 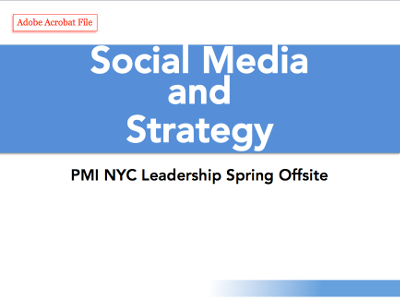 Below is the presentation Stephen Nosal, Vice President of Marketing, and I collaborated on to lead a discussion around integrated communication and what social media support might look like. Yesterday’s objectives included how the chapter shares events and activities that improve community persona need. You can download Adobe Acrobat or PowerPoint version just below. To view presentation within this site, scroll below the 2 slides. View deck through SlideShare embed. Hey Toby, yet again I was happy to see my smiling face on one of your slides. ps. 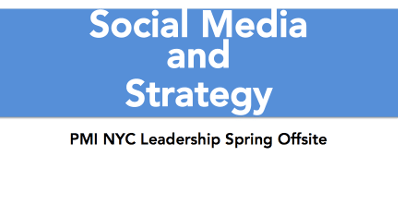 we should really try and catch up to have a chat about social media strategy an how to create an effective one. I borrow liberally from your lead – you do not think it is your smiling face that keeps returning to your project management and worldly advice site, do you?